Hours after Japan-based bitcoin exchange Mt. Gox suddenly halted trading activity, the company’s website is now completely offline. Notably, the news follows other troubling signs that all is not right with the exchange, such as its sudden removal of its entire Twitter feed. Bitcoincharts market section shows the last trade on Mt. Gox occurred at 01:59:06 UTC, which is 8:59 EST. Not long after the suspension in trading activity and subsequent outage, leaders within the digital currency space joined together in a bid to restore confidence in bitcoin and distance themselves from the embattled exchange. “The purpose of this document is to summarize a joint statement to the Bitcoin community regarding Mt.Gox. This tragic violation of the trust of users of Mt.Gox was the result of one company’s actions and does not reflect the resilience or value of bitcoin and the digital currency industry. There are hundreds of trustworthy and responsible companies involved in bitcoin. The statement also names the following bitcoin industry veterans as supporting this position. Mt. 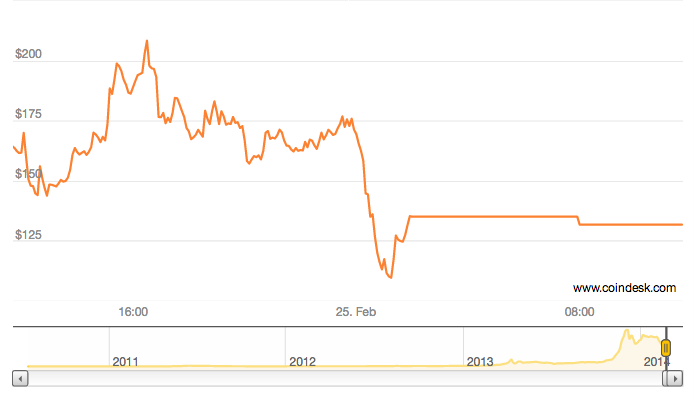 Gox price on CoinDesk today. The outage of Mt. Gox and the subsequent joint release of this statement follows unconfirmed reports about the future of Mt. Gox’s viability as a bitcoin exchange.